There's still work to be done, but for desktop users, ROLI's Beatmaker Kit goes a considerable way towards its stated aim of demoncratizing music-making. Roll on a couple of years and with a revised and upgraded version of the Lightpad Block (the Lightpad Block M) which addresses many of its predecessors’ inconsistencies. With improvements to the Noise app, along with far greater software support and integration with Digital Audio Workstation software like Apple’s GarageBand and Ableton Live, the system now seems like a far more convincing proposition. 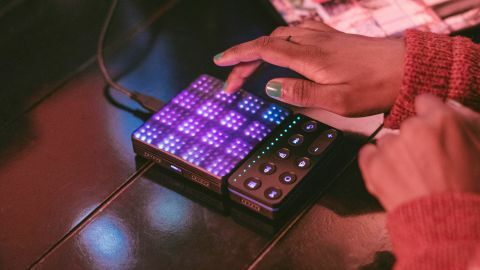 Back in August, ROLI released the Songmaker Kit, a discounted bundle that includes the Lightpad Block M, a Loop Block for track controls, and the latest addition to the range, the Seaboard Block, a mini version of the company’s flagship multi-touch keyboard. It's now followed this up with another bundle just in time for Christmas. The Beatmaker Kit is aimed at those primarily looking to make their first steps in beat making and finger drumming. It includes the Lightpad Block M along with a Loop Block, but omits the pricey Seaboard Block. It also boasts a sizeable software offering, crucially including a generous six-month subscription to Melodics music education service (more about that later). The bundle is considerably cheaper than buying the included hardware individually, and that’s before factoring in the software and subscriptions that make up the deal. We put the kit through its paces in desktop mode first of all, pairing the two included Blocks with our Apple iMac. After going through an online registration, we were directed to a suite of programs to download, along with a playlist of well thought out YouTube tutorials demonstrating how to use the hardware. The desktop software bundle for both Mac and Windows includes a 'lite' version of the ubiquitous music sequencer Ableton Live customised to work with the Lightpad Block and similarly lightweight versions of software synths Strobe2 and Cypher2. The two key apps included in the package, however, are ROLI Dashboard and Equator Player. As well as acting as a means for updating the Blocks firmware, Dashboard allows you to configure Blocks to work as a midi controller with third party software instruments and DAWs, with presets for programs like Garageband, Logic and Ableton Live. It can also be used to adjust the sensitivity of the Lightpad Block M, as well as make changes to scale and octave parameters when in instrument mode, letting you set up the pad as a grid-based keyboard that can be set to certain key so you won't hit a duff note during performances. Equator Player, meanwhile, is a software synth that works standalone or with a sequencer that’s been designed from the ground up by ROLI to demonstrate the '5D' capabilities of their Seaboard keyboards and the Lightpad Block M.
The clear jewel in the bundle, it’s a really impressive software synth with a wide palette of 200 sounds. Among the many highlights within its patches is an overdriven guitar sound that really shows off the string-like note bending and vibrato capabilities of the Lightpad Block, likely to bring out the Eddie Van Halen in even the most amateur of musicians. Equally as fun is a jazzy Fender Rhodes style electric piano preset that let you subtlety add a tremolo effect when sliding notes sideways. As with much of the software bundle, Equator Player is a scaled back edition, with the full version, which offers the ability to edit presets along with the addition of a further 300 sounds, available for upgraded for a discounted £75 for owners of the Beatmaker Kit. Using the Lightpad Block M with Equator, it soon becomes clear how much an improvement it is over its much-maligned predecessor. More tactile, with brighter LEDs, and a more sensitive playing surface than the original Lightpad Block, you now no longer need to press as hard to trigger notes or beats, while the mis-triggering of notes that was a constant frustration when using its predecessor never really reared its head during testing. When using the pad for drums, the wide range of velocities sensed by the surface mean making consistent sounding beats when using the device out of the box is near impossible, but this is easily rectified by tinkering with the pad’s sensitivity settings in Dashboard. There does, nevertheless, remain an issue with notes sticking when using the Lightpad Block M over Bluetooth. We regularly experienced annoying unending notes when playing the device over extended periods, that would often require powering the device down in order to shut it up. This meant we were more inclined to use the device connected to the computer via the supplied USB 3 lead, negating one of the system’s major selling points of being wire-free and making it hard to recommend for live performance in this way. It’s a huge shame as the latency of triggering sounds from the Lightpad over Bluetooth was impressively unnoticeable, particularly when connected to our iPad and iPhone – more on which later. Fingers crossed that future updates from ROLI will address the problem. It’s also worth noting that the limited range of notes available when using the Lightpad in instrument mode does often raise frustration, most notably when playing a note on either the left or right edge of the surface where there’s no adjacent note for you to slide to. Pairing up the devices with our sequencer of choice, Apple’s Logic Pro, was straightforward enough via the corresponding preset in Dashboard. A number of Logic’s built-in instruments support MPE, opening up the possibilities of added expression in the likes of its excellent synthesiser Alchemy. Using the LightpadBlock to control track faders also worked well and felt responsive, although the limited range meant for more precise changes you’ll likely revert back to using your mouse for finer adjustments. Up until this point we’ve barely mentioned the other part of the Beatmaker Kits’ hardware bundle, the Loop Block. While its playback and track control shortcut buttons do add a layer of convenience and are also reliably responsive when used with Logic, they nevertheless feel like a bonus rather than an essential device. Bearing in mind they mirror controls that are relatively easily accessible in your DAW they’re hard to recommend buying separately outside of the Beatmaker Kit for their hefty asking price. As a performance instrument, the Lightblock M’s small form means there’s a bit of a learning curve, particularly when using it to trigger drums. Therefore, the addition of a subscription to the excellent music tutorial service Melodics is a very welcome bonus to the Beatmaker Kit. Once the software is installed and you’ve signed up to the service, lessons are presented in a form similar to Guitar Hero with notes moving across the screen that have to be hit in time to earn points. Crucially, Melodics has a series of courses dedicated to finger drumming and triggering samples. Coupled with a dedicated preset for Melodics that can be accessed via ROLI Dashboard, it makes for a genuinely fun and compelling learning tool that does a great job of balancing the fundamentals of drumming and rhythm with interactive lessons built around contemporary tracks from the likes of Diplo. Usually costing up to a pricey $29 a month, the six-month Melodics subscription included in the Kit seems pretty generous and should go a long way to helping novice music makers get up and running making tracks. Considering the pocket-sized portability of the Blocks hardware, it’s therefore a shame to find that the software offering for mobile is a poor relation to what’s available to desktop users. Support for Android is near non-existent, extending only to Google Pixel devices with no dedicated apps. For iOS, there’s no corresponding Dashboard app for making changes to the Blocks, nor is there a Melodics app that works with the hardware. Instead the offering for Apple mobile devices amounts to two apps: ROLI Play, a brief tutorial app that guides you through the fundamentals of using Blocks; and NOISE, a loop-based sequencer program with a built in synth that uses the same excellent sound engine as Equator. NOISE gives you access to 128 different presets, including multiple drum kits to various piano, synths and even panpipes. There's also the option of downloading additional sound packs created by a varied range of artists such as Grimes, Rudimental and Wu Tang Clan producer Mathematics. Drumkits are divided into two types, regular single hits and groove kits, the latter of which play a loop when holding down your finger on the corresponding pad. Using a grid-based system for triggering loops, users have long been critical of the limitations of Noise, and in fairness a lot has been improved since it was originally released. Much requested features like being able to overdub when recording ideas and the ability to add effects and change the length of loops have since been added, but it nevertheless still feels very restricted as a platform for making music. You’re limited to one drum kit and three other instruments when working on a track, there are no options for swing, shuffle or any odd time signatures for beats, while there are scant options for customising presets or drum kits. Thankfully the Blocks hardware can still be used with other iOS sequencers, most notably GarageBand which has full support for MPE, meaning the Lightpad Block works really well with its built-in Smart Instruments including its orchestral strings and synthesizers. Other aspects of the music-making-on-the-go experience are also positive. Battery life is decent, offering around four hours of playtime, with the devices’ DNA connectors letting you distribute power across multiple units, which handily means you can charge over a single USB connection. Blocks always felt like a great concept that was released way before it was ready. Its taken a while for it to deliver on its early potential, but for Mac and PC users at least, the Beatmaker Kit shows that ROLI now have a platform that goes some way to its stated aim of democratising music making. The added expression that the hardware and software offers means it’s now also worthy of consideration for more experienced producers. The sparseness of features in NOISE means there’s still much work to be done on the mobile front for Blocks to be a mobile music making force to be reckoned with, but ROLI’s track record so far for acting on users criticism does at least provide hope that they’ll address these issues. At roughly $300/£250/AU$400, its far from being in stocking-filler territory, but there’s a decent saving to be had here for beat makers likely to make use of all aspects of this considerable bundle.